As most of you recall, Hurricanes Irma and Maria affected two of the three USVI in a major way more than a year ago. Here is an update of their status. The U.S. Virgin Islands — encompassing St. Thomas, St. Croix and St. John — have seen hurricanes before. But when two Category-5 hurricanes walloped them within the span of two weeks, one wonders how fast they can recover. Before the hurricanes, St. Thomas was one of the most popular Caribbean cruise destinations. Its two cruise terminals — Havensight and Crown Bay — can accommodate up to a half-dozen mega-ships at a time. Sugar-fine beaches, endless watersports, harborside dining and duty-free shopping keep visitors well occupied for a day in port. We are happy to report cruise ships have returned to the island. Driving around the islands, you will notice significant damage; many hotels and resorts have yet to fully re-open. Resilience is a way of life for Virgin Islanders, however, and the storms have sparked locals to rebuild and improve. There is revitalization coming to the downtown area, and St. Thomas has plans for the future. Magens Bay is better than ever before. In a rare positive note “after,” the hurricanes washed more sand onto the shores, expanding the beach here. Royal Caribbean made a quick commitment to this cruiser favorite, and began cleanup and replenishment soon after the storms, with a re-dedication ceremony in December 2017. Today, the bar and snack shack have been rebuilt, on a wooden platform. At one end of the beach is the art project commissioned by Royal Caribbean after the storms — colorful posts of reclaimed wood — on the other, sand, sea and a grove of replanted trees. Magens is still the quiet slice of paradise that visitors and residents alike remember; locals comment that from an aerial view, the beach has become even more heart-shaped. Another cruiser favorite, Sapphire Beach, was recently the location of a sunset photo shoot. In other parts of the island, nearly all beaches are open, but might offer limited concessions. If you enjoyed the cuisine before the storms in St. Thomas, you will see a few things have changed — many for the better. Unfortunately, a few establishments are gone, including Cuzzins Caribbean Restaurant & Bar in Charlotte Amalie. The former hotel restaurant and bar known as Iggies has rebranded and offers gorgeous views of the bay along with a pool that swims up to the bar, and lots of lounge seating. Despite a few closures, most of the favorites are back and ready to serve you. In fact, local restaurants like Gladys’ Cafe and My Brother’s Workshop (MBW) Cafe & Bakery were back immediately following the storms, collectively serving tens of thousands of meals to those in need. Now undergoing a massive renovation, Gladys’ Cafe is currently operating out of a lovely venue just across from its current location. Some places, like Sib’s on the Mountain (a 10-minute ride from the cruise terminal), have weathered many storms since the restaurant’s establishment in 1924 — and remarkably remain open. New restaurants have opened in the past 10 months, too, including a lively bar, arcade and bowling alley popular with locals called Chicken’n Bowling. Considering it’s within walking distance of the Havensight Cruise Terminal (next to the Shipwreck Museum), we anticipate it might also be popular with cruisers looking for a bite and something to do with kids. A lot is — and has been — up and running around St. Thomas to keep cruisers busy, but some attractions are still closed. “We did lose some attractions like the zip line and the Great House, which are going to take a little time to recover,” says Reeve, who immediately begins explaining what’s new on the island with enthusiasm, including a project that’s been in the works for years. The Virgin Islands Harbor Hopper will be a water transportation system serving the areas most frequented by cruise ship visitors; the first phase will run from Havensight to downtown and Crown Bay, with an expansion plan to reach places such as Water Island or Yacht Haven. “It’s a great way to get downtown and avoid the traffic,” says Reeve. The Harbor Hopper is expected to be up and running by the end of 2018; purchase of a ticket allows one to hop on, hop off as much as you want. 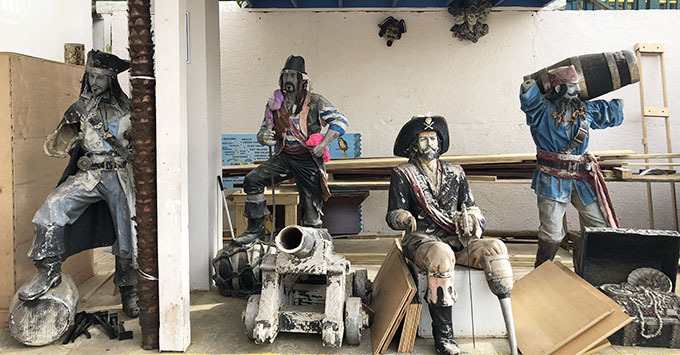 Another new St. Thomas attraction also revolves around pirates — and their treasure — with thoughtfulness, expertise and just the right amount of camp. Pirates Treasure: A Shipwreck Museum had just opened in June 2017, it is now restored to its originally intended glory, offering a deeply fascinating look and feel into shipwrecks, antique coins and the men (and women) who sought them (plus a Jack Sparrow impersonator). And if you know pirates, you know the love of rum. Luckily, that might become even more available to the masses soon, according to Reeve. “We may be getting a rum distillery at some point, but that is probably about a year out or so.” Major rum distillery Cruzan is located on the neighboring island of St. Croix. A cherished place for many cruisers, St. John — just a 20-minute ferry ride from Red Hook dock in St. Thomas — is also on the mend. While some trails within Virgin Islands National Park have reopened, many remain blocked by debris. Acres of mangroves became casualties of the storm, and due to the delicate nature of the ecosystem, they have been left where they lie, waiting for specialists to arrive and possibly salvage some of the undergrowth. Currently, the single ranger-led guided hike in the National Park is not available; however, the trail they used — Reef Bay — has reopened. What you’ll also find inside the welcome center is a series of colorful handmade masks lining the walls. This is part of a community-based art therapy initiative led by the Gri Gri Project to help residents of St. John and other islands in the USVI to heal after the trauma of the hurricanes. Trunk Bay is open, still providing stunning views above and below the water — and temporarily free. A rentals desk lends out snorkels and other gear, bathrooms are functioning, but no snacks or drinks. Back in Cruz Bay, it’s bustling. The shops of Mongoose Junction look pristine, and continue to provide unique shopping opportunities. St. John Brewers is once again expanding, expecting to open its upstairs brewery for tours in the next few months. The brewpub downstairs is fully open. On a sad note, Caneel Bay Resort withstood significant damage from the hurricanes and is currently in a lease dispute with the national park system that will prevent it from reopening for the near future. The same situation applies to the beach and campgrounds at Cinnamon Bay. A lot of the recovery in St. John can only be left to nature. The fate of some of the island’s much-loved properties remains in the hands of the park service while officials determine how to sustainably rebuild. For the foreseeable future, we recommend shore excursions to spend a day in St. John rather than independent travel. Some provide transportation and a tour, while others might take you for a hike and swim along Honeymoon Trail. Without a major cruise port, St. John retains its more off-the-beaten-path feeling. But the island is still accessible and worth the added trip; two major hurricanes haven’t impacted its natural beauty one bit — it still beckons cruisers to explore yet another unexpected side of the Caribbean.